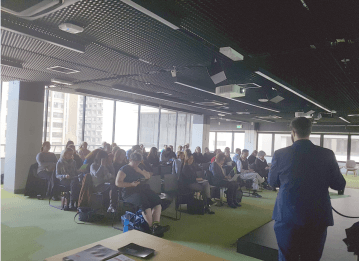 Almost 50 librarians from education, legal, university colleges, industry and government libraries took part in our Melbourne National Liberty User Group Conference and Masterclass in late August with some taking the opportunity to visit the MCC library. They all had a great time and we would again like to thank David Studham and library staff. 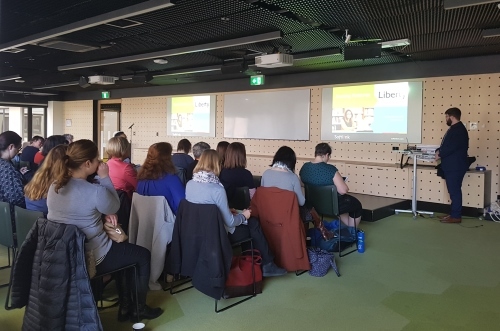 The day’s full agenda began with a brief welcome by John Crook, Softlink Information Centres General Manager, before Sarah provided an overview of the new features scheduled for upcoming Liberty releases. Kirk Mapperson, one of Softlink’s brilliant developers, expanded on the new features in Liberty and sought ideas and questions from the attendees about the features presented. He also asked them to give us an insight about which existing Liberty features were popular with both library staff, and their users. Popular Liberty features included the library maps, the self-checkout option on our mobile app Liberty Link, and the Serials module amongst others. The law librarians in particular commented that their lawyers were increasingly using the Reviews feature to proactively rate and complete the ‘Comments’ text box to note how relevant the material they were reviewing was for a specific topic. After lunch it was time for the breakout sessions with the delegates forming 3 groups, each according to their library type, to discuss issues specific to them. Each of the groups then discussed with everyone the features they were making use of in Liberty, problems facing their libraries and functionality they would like to see included in future releases. An easier way to copy slides for inclusion on the branches’ home page. We appreciate our Liberty users’ suggestions. They are the key to ensuring the product continues to meet and exceed their expectations. Throughout the day, there was positive feedback on features and workflows in the Liberty library management system but we were particularly delighted to hear from our users how valuable they felt the support and communication, provided by our Help Desk team, was to them. One of our single staff libraries commented that speaking to a help desk team member was wonderful because it gave them someone to bounce ideas off as they were on their own in the library. It is great to know that our support staff are sought, not only for their problem solving ability but as a partner to our Liberty customers as they work toward providing valuable services to their library users. After a day full of demonstrations and discussion, those who could, headed to the inviting Platform 270 bar and restaurant at the Doubletree by Hilton for evening refreshments and lively conversation. We thank all those who attended for making it a wonderful day!